I was fortunate to be in Sallynoggin last summer just as one of the first trays of the 2013 Antique Collection was laying out on a tray in shipping with a vendor ticket to a certain famous tobacconist’s shop in Tokyo. 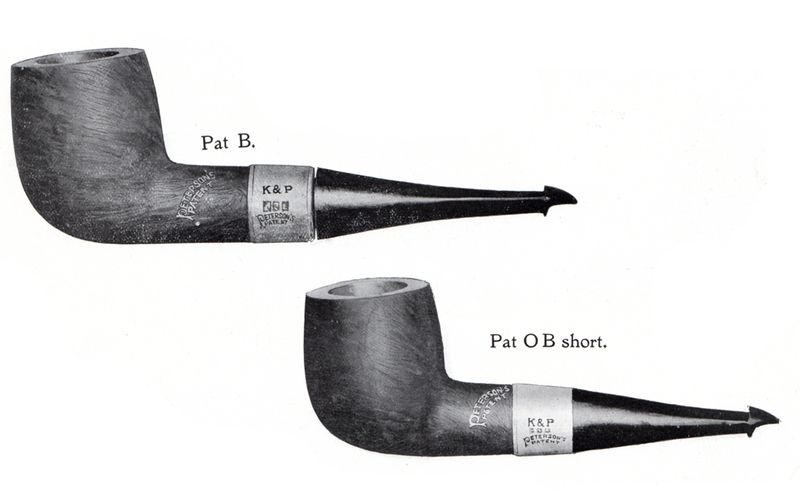 There were about sixty pipes on the tray, and being a great fan of the early Peterson shapes, I was almost beside myself to see the “Pat”—one of the few named Peterson Patent Lip shapes in the 1905 catalog, in both its straight and bent versions—and one I’d long hoped K&P would re-issue. So, with a little persuasion and help from Doris (who’s been in charge of shipping for a little over forty years now), I managed after a day or two to divert two of these lovelies (with official sanctioning) from their original destination in Tokyo to my courier bag. The 2013 Antique Collection is the fourth to appear. The series began in 1996 with a quartet of shapes available in retro-style individual cases or in a companion case as a set. A second brace of pipes appeared in the series in 2005 and a third in 2009. I won’t say I think Peterson always gets it exactly right with their reproductions, but this time they nailed it. If you follow shape fashions in the hobby, you’ll remember that Nose-warmers and Chubbies were a bit of a thing not long after the rage for volcano shapes subsided, with appreciations by Greg Pease, Neill Archer Roan and others appearing on the internet. This latest Antique offering from Peterson fell just a little afterwards. The “Pat” model in the 1905 catalog is illustrated in a number of mountings and stem lengths, but in only three models: the bent, the straight, and the “O” for “oval”— the oval pipes of the period designed for a gentleman’s use and placed in a vest or coat pocket where it wouldn’t disrupt the lines of one’s clothing—as for instance when one went to the “O”-pera and wanted a short smoke entr’acte. 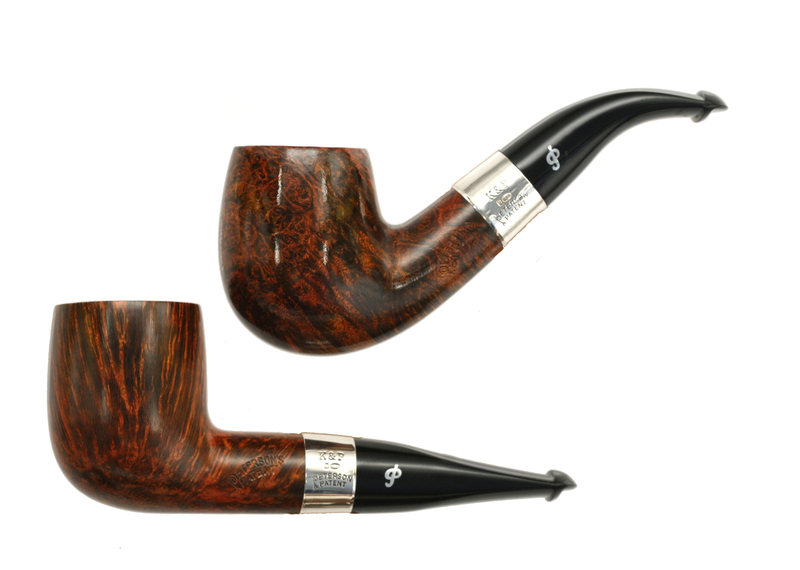 The straight billiard in the 2013 Collection, on the same page of the 1905 catalog, is almost identical to the “Pat B,” but with a slightly shorter, thicker, and to my eye more pleasing stem. One of the indicators of a good nose-warmer to me has always been the comfort of its stem. As you can see, the 2013 Collection scores here with comfortable mouthpieces which measure approximately 16mm wide and 5.5mm thick right in front of the P-Lip, which is well-articulated on both pipes making for comfortable hands-free smoking. I do have one complaint: the original Pats were Patent Lip Pipes, meaning they had Charles Peterson’s final word on the mouthpiece (the 1894 and 1898 patents), with a graduated bore which should travel from 1.5mm at the button to 5mm at the end of the tenon, and a well-developed mouthpiece with the air hole turning up and a good upper and lower shelf on the P-Lip. The 2013 Antique Reproduction’s mouthpieces are beautiful and comfortable between the teeth, but they are not graduated, making them a kind of faux-P/Lip. Whether this was simply an oversight, or considered unimportant, I couldn’t tell you. But if you smoke P-Lip non-System pipes, you’ll register an important difference in how the pipe draws as well as the moisture-level and the perceived coolness of the smoke. I don’t know that this will impair my enjoyment of the pipes as actually smoked, but I do know the smoking experience would have been a different one with a correctly-engineered mouthpiece. 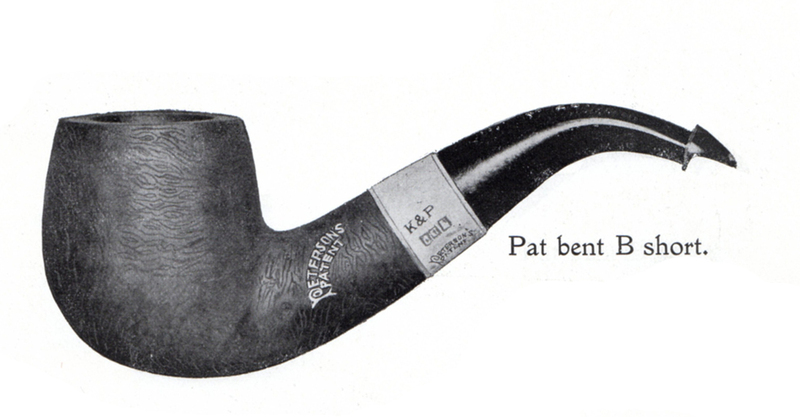 The rims of the two pipes are also slightly different—the Pat Bent B (pictured top) has a slight inward bevel. 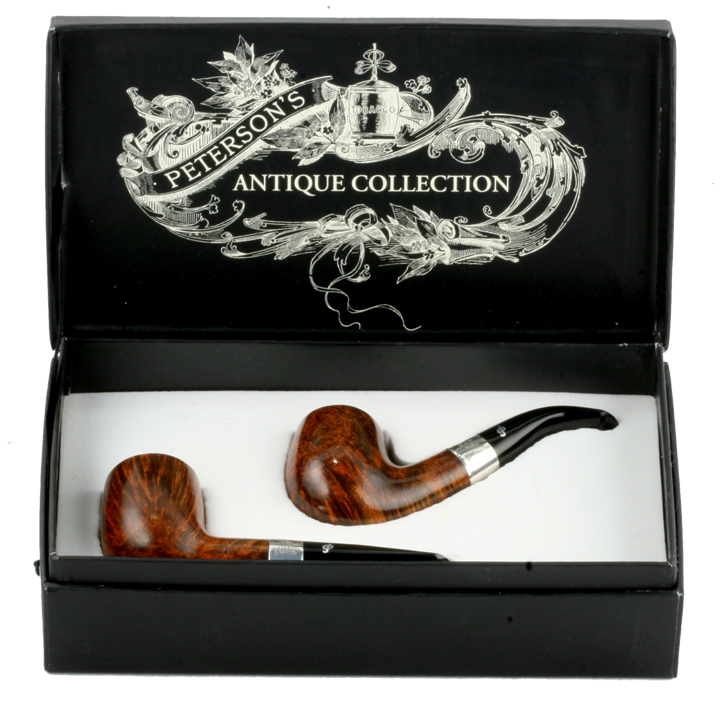 As usual from Peterson, the set is available in the full complement of finishes, from the top-line smooth red/brown finish to the acorn-style rustication Peterson uses on most of its rusticated pipes of late, as well as a gloss-black light sandblast and a semi-matt black ebony. If you’re going for strict authenticity, you’ll want the smooth set, although the ebony has a dressy, Opera-feel about it that one could pretend was actually made back in the day. I wouldn’t be surprised if a natural set appears somewhere at some point—it just all depends on the luck of the wood. Only the smooth finish features an aluminum inlaid “P” on the stem—the other finishes feature a hotfoil-pressed “P.” One curiosity about all the finishes of 2013 Antique Collection pipes I’ve seen, including mine, is that they lack the 2013 hallmark year code—Hibernia is present, and the .925 sterling is also present, but there is no year code. I’ve owned pipes from all the Antique Collections, three of them in my regular Virginia rotation and one of them a spectacular “magic” briar that never fails me. The first Antique Collection I companioned, the 1910 bulldog from the 1996 quartet, is probably lying in a field next to Monasterboice in County Louth, north of Drogheda and not far from Dublin, where an inconsiderate soul left it after having bashed in the back window of my rental car and removing my backpack while I was over photographing some of the Monasterboice high crosses. I would like to believe the vandal took the pipe home and smoked it. If you’re ever there and happen upon a sun-bleached 1910 reproduction with a heavily oxidated stem in the field, drop me a line. Bowl Height: 1.80 in./45.76 mm. Chamber Depth: 1.49 in./38.05 mm. Outside Diameter: 1.43 in./36.46 mm. Bowl Height: 1.81 in./46.03 mm. Chamber Depth: 1.51 in./38.38 mm. Chamber Diameter: 0.78 in./19.84 mm. Outside Diameter: 1.39 in./35.48 mm. Jaw dropping! Got to have them! I’m not a fan of nose-warmers but these are nice looking pipes just the same. I have the other Antique collections and started with the smooth-finished four pipe set that began the series. All my others in the series are sandblast finished. i was alerted to this possible series during a written conversation with Tony Dempsey before he retired. I had written him to see if Peterson could make a reproduction of an antique pipe that I had seen in a reproduction catalog that I purchased from Barry Levin some years ago. Everyone at the factory recalled Dempsey with great affection last summer–the last of the great pipe-smokers at Peterson… at least, for now. Do you recall which pipe in the Levin (1905) catalog you wanted? They’re fairly open to ideas with this series. Mark: what type of COM mark is stamped on these reproduction pipes? I found a 1910 Patent billiard at my local shop. It is stamped “Made in Ireland”. 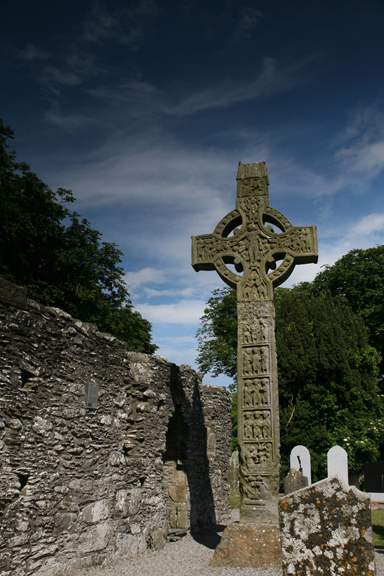 Do the modern pipes say Republic of Ireland? This pipe looked very old, I should have taken a closer look at the hallmark stamping on the silver collar. They were asking $80 but the p-lip button needed some work (rebuilding). The 1910 Patent billiard is part of the first Antique Reproduction series of four pipes that came out in 1996. Great-looking pipe. The issue of COM marks isn’t neat and tidy, I’m afraid. Co-author Gary Malmberg has an entire chapter on them, which, once read, makes most identifications fairly easy. The Antique Reproductions from ’96 that I’ve seen and owned all have a 2 line COM: MADE IN over IRELAND. Current production has dropped REPUBLIC OF IRELAND and just has Peterson’s (script) over Dublin–as well as a shape number & sometimes (Craftsman series, etc.) even a date–all done with a laser! Hi Al–Pipe Makers Emporium at http://www.pipemakers.org has genuine Peterson stems for $7.50–which is the best price around–but the short, straight AB P-Lip isn’t something you can get, seemingly, except at Sallynoggin. It takes about 4-5 weeks, usually, but they hand fit the stem and turn it down correctly so it’ll be a good, snug military mount. I love that 1910 bulldog! 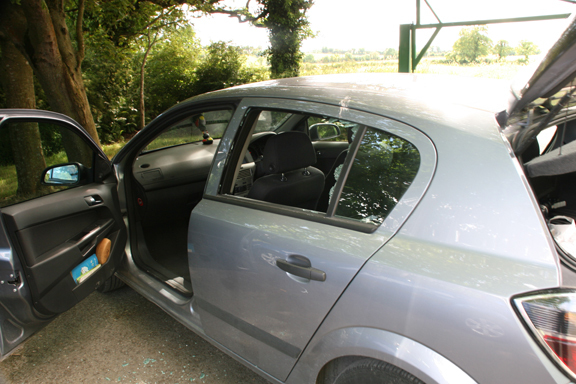 Somebody in Ireland, I hope, is enjoying mine–it was stolen on our first trip to Ireland! You can simply send the pipe, damaged stem, and a cover letter & they’ll email you with payment instructions. Probably around $20–but you can send an inquiry first if you want. Well, I really lucked out. I had posted this pipe in a thread on the PIpesMagazine.com forums (British section). George Dibos, of Precision Pipe Repair (awesome repair/stem man) that he had the same pipe. He had made a fishtale for his pipe and is sending me his original p-lip, so a great outcome. Peterson did email me back that they could do a new vulcanite stem for $25L and $12L shipping, which seemed very reasonable. I’ll do a Reborn Pipes blog on the pipe when I get the replacement stem fitted. Thanks for the replies and info.